Thanks to Hillary Clinton, Iran is now the dominant power in the Middle East. It has long been known that Hillary Clinton was being secretly funded by the radical Wahhabis in Saudi Arabia and Qatar, in order to continue the “remaking” of the Middle East. Her failure to beat President Trump in the elections has pushed the entire world to the brink of war —and that is due to the cabal knowing that Trump will never launch a war against Iran like the “Deep State” had planned to do — and that now has plunged the Saudi-Israeli Axis into turmoil over Iran’s growing power. Crown Prince Mohammed bin Salman and President Donald Trump planned the destruction of the “Deep State”. The Middle East has been on a knife edge of war. The elites present in Davos were sitting there utterly astonished, in absolute shock, while the MSM propaganda media were proven too stupid to ever understand the truth. That was stated by President Trump’s closest ally, and former White House advisor, Steve Bannon. Bannon continued by saying that at President Trump’s summit meeting with dozens of Arab nations in Saudi Arabia last year, “modernisation and reformation” were a big part of the agenda. Understand, we live in a dirty and dangerous world. Tell the public that there is a “national debt” and “deficit spending.” This trick implies legitimate accounting. However, the people must not know that a fiat system implies debt and ultimate default from its inception. Can there be debt when everybody knows that fiat is created to infinity, backed by debt at no cost? Do we really believe the Government “lost” trillions of dollars? This is a false premise promoted by the media. The money was not lost.It was spent on exactly what the elites and the deep state desired it to be spent on, without the public’s knowledge. A bank grants “loans” to you to buy a home or some other large ticket item and calls it your debt, but is it? The bank just created the account out of nothing. It does not even need to have an equal amount of money in its vaults to make the loan. It cost the bank nothing, but the bank calls it your debt or your mortgage and you believe that you have debt. The bank invests in you without risk. If you are unable to pay your mortgage, the bank forecloses on your home. Meanwhile, the bank has taken hold of real property under the guise of the consumer having defaulted on the loan without putting a dime of its own money at risk. In this way, the banks own a majority of the homes and land and this is called economic freedom, pardon me? It is slavery! No real change can manifest in the economic prison nations until the fake debt owed to the Central Banks and all other banks is defaulted on. These banks have to be audited and all assets belonging to the nations have to be taken back from the people running this fraudulent scheme that has continuously entrapped people in fake wars and debt. It will take great care to investigate, audit and gain full control of the Monetary System that is owned by a private corporation and its central banks throughout the world. A complete audit of all the gold holdings of all central banks, will need to be coordinated simultaneously. Because this gold is property of the populace. Once the Central Banks are audited and all their assets frozen by the respective Treasury departments, it is recommended that the U.S. Inc. and other corporate nations default on their debt to its corrupt private owners. The plan is; that the Fed and Central Banks will declare bankruptcy and the respective Treasuries will, on behalf of the citizens, seize all assets of the Federal Reserve and all the other Central Banks. All these trillions in debt will either be dropped in the bankruptcy, or the respective Governments’ Treasury can print useless fiat currency to pay the debt off. It is important to understand that ending the Central Banks will not crash the currency, bond, or stock markets. All three of those are controlled currently by the Exchange Stabilisation Fund through backdoor trading done by the ESF and the U. S. Treasury. It has been proven that the ESF controls all three “free” markets. Eventually, Trump can end the U. S. fiat currency and create a new currency with a basket of commodities to back it up, including gold, silver, other precious metals and commodities. The old “Federal Reserve notes” will become useless after a recall of old currency that weeds out money that has not been taxed – by keeping it in offshore accounts and tax havens. This action will immediately eradicate all off-shore tax-haven money, illegal drug money, stolen and laundered money, and currency held by foreign nations that has been siphoned out of countries illegally. The new currency will be established after the hidden CIA-gold and assets have been audited and seized by the U. S. Treasury. No one knows how many thousands of tons of stolen war gold the CIA, more precisely George H. W. Bush’s Barrick Gold Corporation, has amassed, but it is enough to tip the balance of world gold holdings to America. This gold will eradicate globalism from the current monetary system that is controlled by the same shareholders who own the majority of shares in the top defence corporations, and all major multinationals – all are globalist bankers who loan money to and sell weapons to the very enemies they pretend to be fighting. The insane trillions up to over one and a half quadrillion dollars’ in the derivatives markets are controlled by the Bank for International Settlement BIS, which is the most corrupt bank in the world. The BIS must simply be abolished along with all derivatives and hedge fund betting. 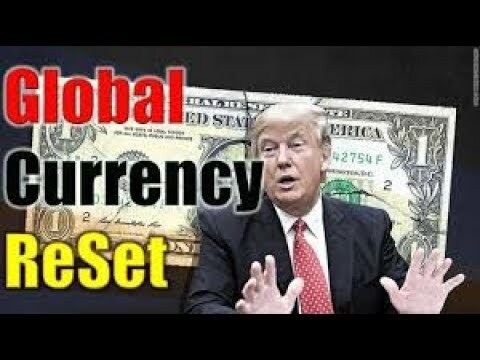 In 1871 the bogus US monetary system was formed under US Inc. and in 1913 linked to their Federal Reserve that was connected to Central Banks across the globe, all of which was owned by the Rothschild Cabal. The Bank of England was the primary bank of the old Cabal system, with all monies funnelled through the Vatican before coming back where governments were forced to borrow it in order to funnel all people’s tax monies into cabal coffers. By 1932, the Federal Reserve had printed so much fiat currency that the USA Inc. was bankrupt and off the gold standard. The fiat system lasted from 1913 to 2012 when the US defaulted, with the Chinese as their primary creditor. The new US Republic takes America back to the original Constitution and their own asset-backed currency controlled by a benevolent AIIB system of the Chinese Elders. The complete global currency revaluation is a critical component to the future of this planet. The fulfilment depends on a level playing field that will unfold as the RV happens. Each country has to become financially stable in its own economy and trade elements with other countries. This will be accomplished, as the RV will be the catalyst for this change. Even the cabal mafia of the world has backed down when they found out the true scope of controls that have been placed on the RV-process. The WDS has installed huge controls on the money, and there is no way that it will be misused due to all the intel they have acquired to date. We, the people will emerge from the slimes of the slump and wade through to get things on track and clean our house. Once the new financial system is in place, all currencies will be switched from fiat to gold asset-backed currency. All RV funds will be protected under the new financial system which is being hosted on a quantum computer. This quantum computer was mainly built by Chinese engineering teams in collaboration with other Alliance members’ engineering teams. Bankers will not be able to access any of these funds without permission from the Global Collateral Accounts Supervisors. For the Illuminati, there will be no civil trials, but military tribunals. Here some excerpts from Alliance Intel. Trump met with Henry Kissinger, the most powerful and evil political warlord in the CFR, who is wanted in multiple nations for crimes against humanity, and told him “no” to his request for clemency. Trump does not listen to this globalist bunch of greedy bankers, brokers, and warlords. Obama created a police state that used illegal surveillance on Trump and all Americans. Now it is time for Trump to turn the tables on the real enemies of America and the world – the corporate intelligence agencies and the corporate warlords. A key action factor to dismantling George H. W. Bush’s New World Order, is to withdraw from the North Atlantic Treaty Organization NATO, the Atlantic Council and all treaties or accords that require America to defend other nations. Trump has insinuated numerous times that NATO is outdated and the member countries don’t pay their fair share. Sever the chains with the New York Stock Exchange and its owner Intercontinental Exchange Inc. (ICE), which is the most powerful player in stocks, bonds, mortgage-backed securities, futures, and derivative markets. Basically, ICE is the biggest “gambling casino” in the world where fractional investments, high-speed trading, and the total control of the so called ‘markets’ that governs investment and retirement capital occurs. The stock markets, like the central banks can simply close. They are private corporations that work hard to steal from the public. Change Banking Rules and End the Glass-Steagall Act that allows commercial bankers to also be Investment bankers – which is simply insider trading. End derivative swaps, fractional banking, investment banking, and replace them with State banks, Land banks, Community banks, and Postal banks. Trump has directly addressed these issues repeatedly that would truly change the criminal activities of banks and brokers. End Corporate Control of the Food and Drug Administration. Stop Monsanto’s poisonous glyphosates, pharmaceutical poisons, pharmaceutical control of vaccines, immunity of drug companies, and end mandatory vaccinations. Don’t allow Monsanto or Big Pharma lobbyists or employees anywhere near government. Secure American borders to protect US citizens. Enforce all immigration laws and rules. End all sanctuary cities. Deport all illegals and respect all U. S. immigration laws. Enact Term Limits for Congress. Create term limits for all state and federal congressional members. Reform election rules so that only public dollars’ support candidates not corporate Super Pacts driven by corporate donations. Trump has said he supports term limits and political reform that ends the control of Washington by career politicians. There is no need for biased, vested interests to “buy control” in Washington D. C. except if it is meant to undermine, manipulate, and control government through corporate corruption. Trump has taken action against lobbyists and even made rules about limiting participation in lobbying after holding public office. Henry Kissinger, the top cabal negotiator and covert power broker, ‘met’ with Trump, attempting to strike a deal, but there are no more deals. And a top executive in the global cabal Carlyle Group was arrested in Shanghai – Q Anon posted photos of the arrest that were taken in real time. The stock market is plummeting. Once the market drop reaches a certain point, it will be ‘game on’. If you are closely following the intel, you won’t be affected by the illusion of chaos – you will only see the magnificent order of the Divine Plan playing out perfectly. The “border wall” is not about building a wall. It’s a message that sovereign countries need to take care of their own, and that youngsters need to know their own heritage and the importance of their extended families. They have the ability to move to another country but only by doing so legally, blending into the receiving culture like others did before them and like immigrants are deemed to do as part of the civilised human race. This was also true of Europe in the 1800s and early 1900s, where immigrants tried to understand the receiving nation’s culture and be a part of it. Simply, by adapting to the country they have chosen. Not isolating themselves in their own conclaves, like they don’t even live in a new environment. Pope Francis was put in as a good guy to clean the mess, then close the Vatican and release the wealth to the people in some way. But the Deep State didn’t agree. He started off doing good and then made a 180 degree-turn. Francis’ overriding feeling when all is done, will be one of regret, regret that he bought into this dark plan and helped take it to the next level. Clearly a lack of guts. To all people of the World Be Awake and Help to clean up this mess! then arrests and prosecutions will follow. William Campbell was an undercover agent for the FBI and the CIA for six years gathering evidence of a grand Russian scheme to “dominate” the uranium industry. There are charges of espionage, bribery and extortion, just to name a name a few, coming from Russian agents trying to take control of U.S. uranium interests. Who knew? It’s clear the FBI and CIA knew about it, along with the Department of Justice, the State Department and most likely, the IRS, because after all, the Clinton Foundation was a global charity fraud. Campbell documented real Russian collusion and treason in the Obama Administration, which has connections right up to President Obama. This story is just getting started. It is predicted that many will be charged with multiple crimes, including treason, before this is all finished. Sometime next March, the DOJ Inspector General, Michael Horowitz, will release his report on the FBI/DOJ handling of the Clinton private email server case, for which Clinton was exonerated behind the scenes months before the FBI investigation was completed.